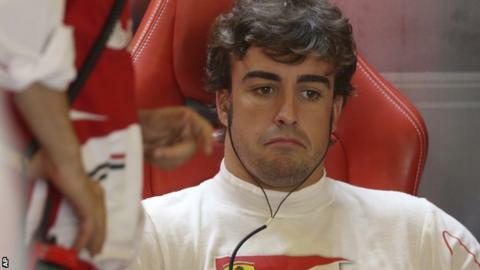 Fernando Alonso has decided to race in this weekend's US Grand Prix in Austin, Texas, despite a back injury. He suffered the problem when his Ferrari bounced over kerbs at more than 150mph during the Abu Dhabi Grand Prix. "Packing the bag for Austin, with some pain, but eager and confident to help the team. I will try to give 100% as always," the Spaniard said on Twitter. He added: "The value of something depends on the way you deal with it mentally and not with the thing itself." Insiders say Alonso will not be completely fit but he will drive as best he can, starting in practice on Friday. Ferrari president Luca Di Montezemolo said: "I am pleased to see that Fernando is so keen to give it his all, even when he's not at his best. "It shows how attached he is to us and I am sure that his example will be a further boost for the whole team in its efforts to end this season in the best way possible." He will probably be checked by doctors from F1's governing body, the FIA, on his arrival at the track. Alonso was in contention for the drivers' title until Red Bull's Sebastian Vettel started a remarkable run of form that has led to seven consecutive victories and the German clinching the championship in India last month. Alonso, world champion in 2005 and 2006, is already almost certain to take second in the drivers' championship. Alonso had a series of tests on his back last week. It suffered a compression in the incident and he has been taking anti-inflammatory drugs to reduce his pain. The sensors in the 32-year-old's car measured the impact at 28G as he ran off the track to avoid Jean-Eric Vergne's Toro Rosso. The medical alarm is triggered when it records a G-force of 18 or more and means the driver must go to the medical centre for a check-up. Alonso conducted media interviews after the race in Abu Dhabi before going to hospital for what a Ferrari spokesman referred to as a "normal precautionary check", which was requested by the FIA. The incident happened as Alonso left the pits following his final stop on lap 44 of the race. He came out alongside Vergne and had to take action to avoid the Frenchman, who later said he had not seen the Ferrari as he entered the 155mph turn. Despite being launched over the kerbs, Alonso passed Vergne while running off the track but was cleared of wrongdoing by race officials, who accepted that he had no choice but to run wide.